Au Sable is a follow up to Amon26's earlier title All of Our Friends Are Dead. While I didn't play much of the first game, I found Au Sable compelling to the end. It's fitting that this game was released just before Halloween 2009, as the theme fits that holiday very well. It's dark and violent, though the violence is somewhat abstract. 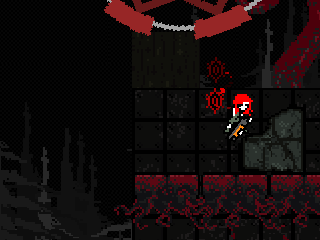 The graphics are dominated by red and black, and grotesque imagery abounds. Scrawled messages relate the story as you progress, which seems to have something to do with murder and depravity. Sound design is strong--the music, sound effects, and occasional voices are minimalistic but well-placed and effective. Controls use the keyboard and mouse, and although they are responsive, I had a little trouble with them occasionally. Sometimes I knew what I was trying to do but had to be conscious of what I was doing with my hands, drawing me out of the otherwise immersive experience. Overall, this is an impressive title. I should mention that it might be a little disturbing for some players. The action and the theme become intense in places, in addition to the ubiquitous evil-looking imagery. But if that doesn't bother you, you might enjoy the game a lot. Recommendations: The 1 people who like Au Sable also like the following games. Short, but lurks you into the game. Not your usual horror game, it doesn't got those 'something scary pops up' moments, but the atmosphere is pretty great. Very good pixel artists here aswell, really fine detailing. The story kindof confused me at first, but I have barely played a horror game where I did instantly got what was this all about. At the end, we come down at a regular, but now in 2d, horror shooter. Overall very good, you get a deserver 8/10 from me. It's like Duke Nukem had a bad trip. I like it. I haven't beaten it yet, but it is pretty fantastic. It is so polished and beatiful; I'm about to cry. this game is so creepy. i like it.